Roman Paska is a writer, director, filmmaker and puppeteer whose original productions, under two successive company names, Theatre for the Birds and Dead Puppet, include The End of the World, God Mother Radio, Dead Puppet Talk andSchoolboy Play, which was commissioned by Linz ’09 European Capital of Culture and presented in 2010 at the National Theatre of Portugal. 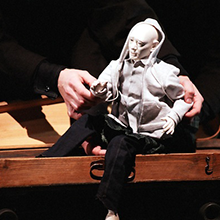 He directed August Strindberg’s Dreamplay with puppets for its centennial at the Stockholm Stadsteater, and for several years was director of the Institut International de la Marionnette in France. His magical-realist documentary feature, Rehearsal for a Sicilian Tragedy, with John Turturro, premiered at the Venice Film Festival in 2009, and has since been seen at the Hamptons Film Festival, Lincoln Center and BAM. The residency will be used for further development of a Dead Puppet work in progress, Roman Paska’s Echo in Camera, a performance that recasts the Orpheus legend as a puppet play-within-a-play, and will focus on reworking the performance through discussions, improvisations and rehearsals, particularly on refining the performance technique with puppets created uniquely for the production.